Laboratory of X-ray micro and nano computed tomography of Materials Characterization and Advanced Coatings research group is a part of the Advanced Nanotechnologies and Microtechnologies research program in the Central European Institute of Technology (CEITEC) at Brno University of Technology. You can read more about us in section About us. 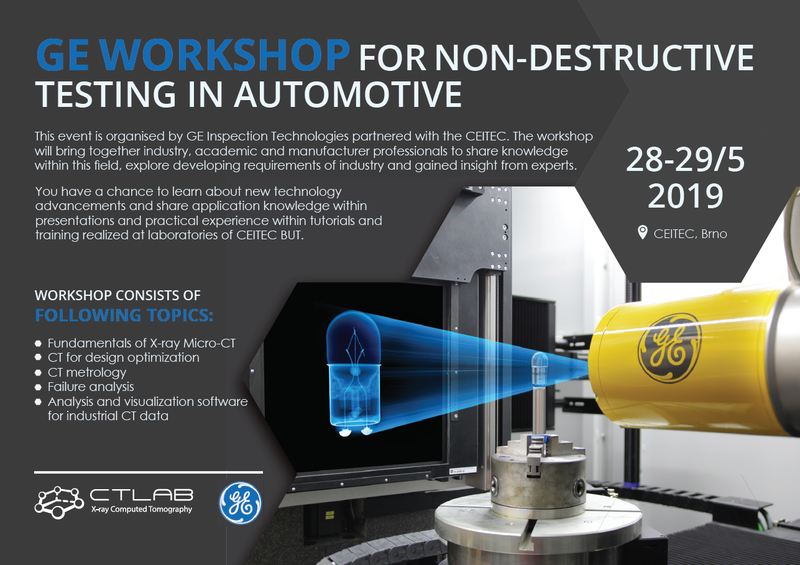 On May 28 and 29, 2019, our laboratory organizes the first GE workshop for non-destructive testing in the automotive industry. This is a unique event in the Czech Republic, co-organized by CEITEC BUT with the manufacturer of CT's General Electric systems. Among others invited participants are representatives of CzechInvest, Volume Graphics, Czech Metrology Institute and Synchrotron Elettra (Italy).